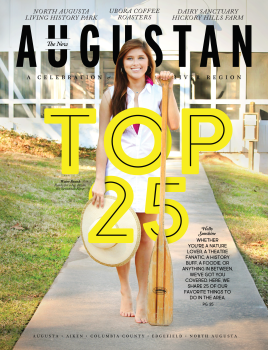 14 of the best fall events in Augusta&apos;s River Region that you won&apos;t want to miss in October. Forever Pumpkins : Why carve a pumpkin that you&apos;ll have to throw away when you could carve and paint a hand-thrown clay Forever Pumpkin at Tire City Potters in downtown Augusta instead? Westobou Festival : Kevin Hart at the James Brown Arena, Westobou Central on the Augusta Common, Allen Stone at the Imperial Theatre, a late night series featuring Chris Robinson Brotherhood, El Camino Boyz and Cory Branan are just a few of the awesome events going on during the festival. Swing & Sway : Bring a picnic blanket or lawn chair, beverages, bug spray, and a dancing spirit for a night of music under the stars at Phinizy Swamp Nature Park. Greek Festival : Grab some authentic Greek food and have a seat as you enjoy traditional Greek dances and live music. Make sure to stop at the bazaar to pick up a pashmina or a bottle of olive oil during this three day festival at the Holy Trinity Greek Orthodox Church. Hispanic Festival : Sip on a fresh Piña Colada, sample authentic Hispanic food, and enjoy folk and musical performances at the Augusta Common. The Becky Buller Band with special guests Kenny and Amanda Smith : Don&apos;t miss the next concert of the Budweiser True Music Southern Soul and Song Series at the Imperial Theatre. Southern Suds : This event at the Augusta Museum of History features live music, interactive games, beer talks and Augusta and Georgia craft beer tastings including a limited edition vintage brew from River Watch Brewery. Recipe #888 for a wheat and persimmon beer was discovered in a 1870&apos;s cookbook found in the museum collection - don&apos;t miss the chance to taste it&apos;s modern re-creation, called "Per Simma Down." Colonial Times: A Day to Remember : Get a glimpse into the daily life of Colonial settlers at this two day festival featuring demonstrations in pottery, weaving and spinning, frontier trading, quilting, blacksmithing, meat curing, gold and silversmithing, candle making, and much more at the Living History Park. Summerville Tour of Homes : Wander through iconic cottages and Antebellum mansions that line the historic Summerville neighborhood in Augusta during this self guided event. Don&apos;t forget to stop at the tour headquarters at the Appleby Library and explore the Georgia Grown Village. Jack-O-Lantern Jubilee : North Augusta&apos;s annual fall family festival will feature live music by The Charlie Daniels Band and Robert Randolph & The Family Band along with rides, corn hole, crafts, and street food in the center of downtown on Georgia Avenue. Fall Steeplechase : Aiken hosts the annual Holiday Cup - which includes 5 steeplechase races around the track, tailgating, a carriage parade, a costume contest, trick-or-treating along the rail, and the Village of Shops. Halloween Family Camping Night : Camp out under the stars at Phinizy Swamp & Nature Park for a weekend of fun including campsite trick-or-treating for kids, a guided night-time cemetery walk, hot dogs and s&apos;mores over a fire, hayrides and a morning nature hike. The Rocky Horror Picture Show : Misfit Theatre Group presents it&apos;s annual tribute to the legendary cult film sensation The Rocky Horror Picture Show shadow cast live on stage one night only at Sky City. Walk with the Spirits : This 45 minute walking tour at Saint Paul’s historic colonial churchyard is lead by costumed guides who divulge the history of the cemetery along with interesting facts about the "spirit" that they are portraying. Along the way, you&apos;ll stop and hear stories of notable citizens from Augusta&apos;s past.